On 25 May 2018 your business should have been GDPR-compliant. But it’s not too late to take care of your data protection obligations in a cost-effective and legally safe way - we’ve created this Special Report especially for businesses that are struggling to get to grips with the complexities of the GDPR. 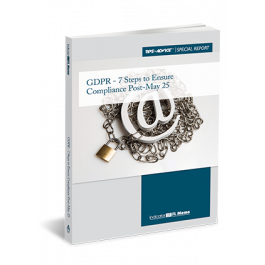 Full of useful examples and practical advice, use it as a checklist to get your business quickly GDPR-proof.